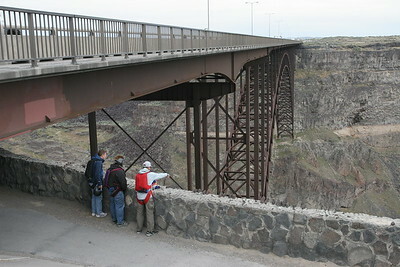 The Perrine Bridge stands 486 feet above the Snake River just north of Twin Falls on U.S. Route 93. Completed in 1976, replacing an older span, the 1,500 foot long bridge over the river canyon has become a Mecca for BASE jumpers. Miles Daisher has dreams of falling and of flying. Then he wakes up and falls--with style--off a bridge. 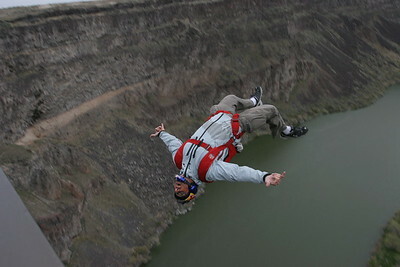 The 41-year-old from Twin Falls loves to jump out of planes and to jump off of high edifices and natural precipices, a sport known as BASE jumping. BASE is an acronym for buildings, antennas, spans (or bridges) and earth (or cliffs). Daisher has been jumping out of planes since 1995 and off of BASEs since 1996. 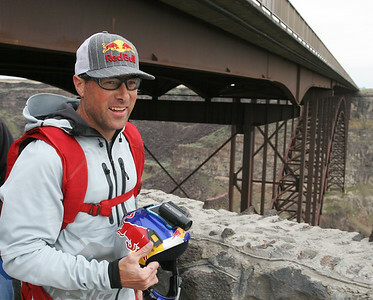 I met up with Daisher at the Perrine Bridge in Twin Falls the first week of May and watched him casually stroll to the center of the bridge, hop up on the rail and launch himself into thin air 486 feet above the Snake River. About the moment I grasped what the blazes he was doing (two or three seconds after his jump), Daisher opened a parachute and gently continued his descent to a meadow alongside the river. "I'm living the dream ... Falling is my motto for life," he said. 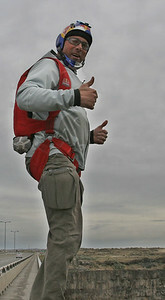 Daisher has BASE jumped 2,669 times and holds the world record for the number of jumps off that span in one day. 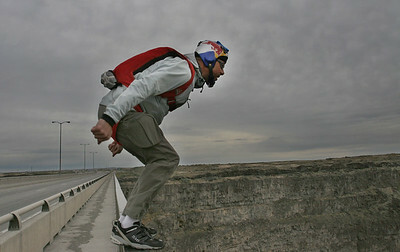 On Sept. 16, 2005, he jumped off the Perrine Bridge 57 times. 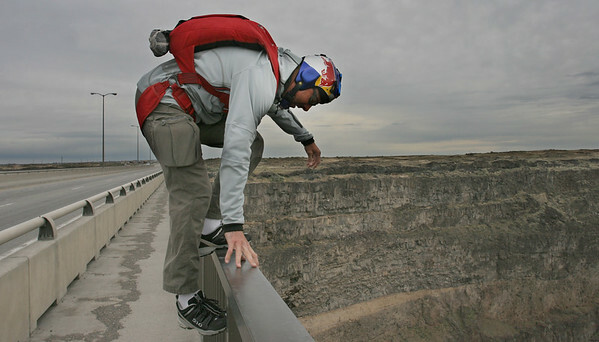 There are no permits required to BASE jump from the Perrine Bridge and according to the BASE fatality list, there have been six fatalities related to BASE jumps here. The next nearest place to BASE jump is in Moab, Utah. The bridge is under the jurisdiction of the Idaho Transportation Department. "The ITD has reviewed its liability and has determined that we are not liable or responsible for this use [BASE jumping] of the bridge," said ITD District Engineer Devin Rigby. "They are not causing any problems with the primary use of the bridge. As long as this is the case, the ITD will continue to have a hands-off policy." 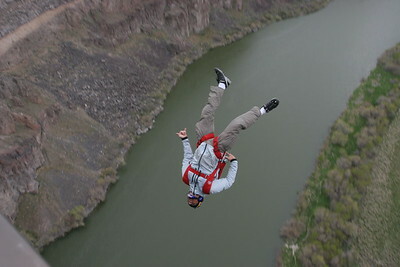 Once a BASE jumper has performed all four types of jumps, they can apply for a BASE number. "I'm in the club and have jumped all four. Miles Daisher is BASE 779," Daisher said. 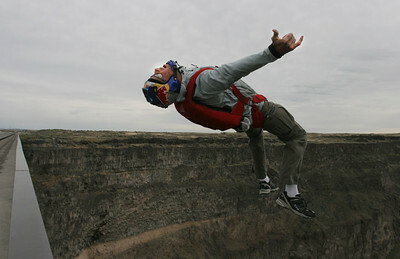 Daisher is a professional skydiver and is on the Red Bull Air Force skydiving team. He has been married for six years to Nikki, who BASE jumped once (on her birthday) and told Miles he can keep it. They have three children, ages 1 to 5. Daisher is also doing cutting-edge sky work with a new sport he and a friend invented called skyaking: skydiving while seated in a kayak. 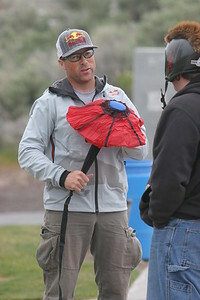 This is a whole new dimension in skydiving that Daisher and Scott Lindgren, a kayak designer, have pioneered. About eight years ago, Lindgren asked Daisher if he would take a kayak out of a plane with him. Daisher agreed, and set out to find someone with a plane who would take him up. Apparently that's not a common request, and most pilots shy away from requests so far out of the box. Daisher eventually found someone who would take them up in a plane, and the skyak team has been refining the equipment needs for this new sport and promoting it across the United States and Europe. The seated position in a kayak is unnatural for skydiving so it takes some getting used to. The skyaker can actually land on water or on land. There are no plans for this to be demonstrated in Idaho yet, though Daisher did appear on the Today show earlier this year to talk about the hybrid sport. 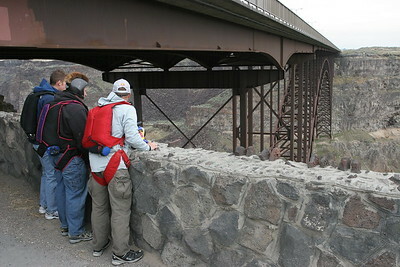 Back at the Perrine Bridge, Daisher landed, put the chute in a loose backpack and hiked back up the side of the canyon. As he reached the top, two jump students, Thomas Lanners and Shannon Jurdine, met him. They came down from Alaska to get some jump instruction with Daisher, and after a few days of windy, unsafe conditions, they were finally able to jump. When the weather was bad, Daisher put them to work putting up drywall on his basement remodeling job. When the weather is good there can be several jumpers taking the plunge off of Perrine. According to Daisher, the Perrine Bridge is an ideal location because once you are beneath the span, it does not matter too much which direction the wind is blowing (and in Twin Falls, the wind blows a lot). If it were an earth jump, the wind could easily blow you into the cliff wall and create all sorts of complications. In the afternoon, the wind picked up more than the trio of daredevils felt safe with, so they called it quits. The following morning I awoke several times dreaming that I was jumping off of the bridge just as casually and confidently as Daisher, sans parachute or anything else to ease my own descent. I don't think I'm suicidal, but I was curious about having a dream like that so I called Daisher to ask him about it. Max: "Do you ever hear anyone talking about taking a dive off the bridge ... or any BASE ... without a parachute?" Daisher: "Well some people have stepped off without a parachute and didn't make it. I think that was their plan. I've had dreams of landing wing suits easily on a snowy slope. I'm not gonna go out and do it but have thought a lot about it." A wing suit, or squirrel suit, is a jump suit worn by a skydiver that has material between the legs and under the arms to make wings. When arms and legs are spread out, an airfoil is created, which then allows the skydiver to glide. This type of gliding does not afford adequate control to land safely, so a parachute is still necessary to end the flight. Daisher lives by another motto, too: In this game you need be present to win. "This means a few things. Like you can't do it unless you are there and you need to be careful and stick around if you want to win the BASE game. Treat each jump with respect: respect for how things work in the world and respect for yourself while taking care of and being true to yourself," he said. "Each decision you make may have a big outcome so train yourself to make good decisions every time."